This is the second of six resources in the series: ‘Drawing for Science, Invention & Discovery Even If You Can’t Draw’ by Paul Carney, educational consultant and author. The projects enable teachers of both art and science to approach drawing from a new perspective. You can see all of the resources here. Introduction: Many of the world’s greatest inventions have occurred by chance. This activity shows you how chance plays an integral part of the making process in art and shows you how artists try to manipulate it to further their creative purposes. To discover new, abstract ways of drawing using chance and random events. To learn how to control and manipulate chance as part of the creative making process. To learn that the sciences often employ serendipitous triggers to spark information based ideas. Key Stage 2: Pupils should be taught to improve their mastery of art and design techniques, including drawing, painting and sculpture with a range of materials (for example, pencil, charcoal, paint, clay), and learn about great artists, architects and designers in history. Key Stage 3: Pupils should be taught to develop their creativity and ideas, and increase proficiency in their execution. They should develop a critical understanding of artists, architects and designers, expressing reasoned judgements that can inform their own work. Upper KS2: The development of scientific thinking and the ways in which scientific methods and theories develop over time. They should encounter more abstract ideas and begin to recognise how these ideas help them to understand and predict how the world operates. Key Stage 3: The development of scientific thinking and the ways in which scientific methods and theories develop over time. Teachers should feel free to choose examples that serve a variety of purposes, from showing how scientific ideas have developed historically to reflecting modern developments in science. Key Stage 4: The development of scientific thinking and the ways in which scientific methods and theories develop over time. 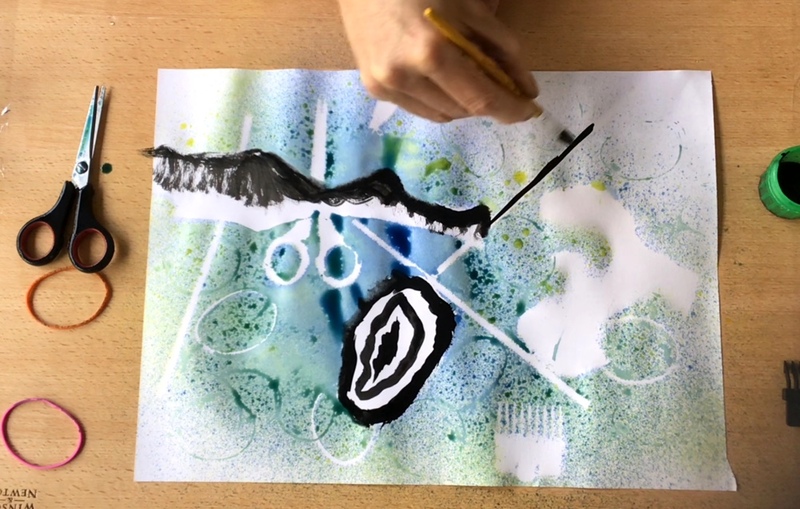 A3 and A4 paper, spray ink bottles filled with Brusho ink powder or similar, assorted scrap objects with interesting shapes, black ink and brush or dip pens. Use constant repetition of the exercise and allow pupils to take more control of the process; adding or omitting items, changing the art materials and allowing more freedom. Limit the use of objects and media, encourage them to think about the composition of the fallen objects and the spaces between them. Confident outcomes should demonstrate greater manipulation of the materials in the process. They will show they can build greater tension in certain areas by building and layering colour and leaving space between some objects. They will use the black ink carefully and deliberately to create interesting visual compositions. Pupils with less successful outcomes will rely completely on chance and have not demonstrated how they have manipulated it to suit an intention. Investigating how chance discoveries have shaped understanding in other subject areas such as maths, history, English, music and technology for example.